The New Vienna Lions Club recently inducted two new members into its organization during a brief ceremony in the town’s community room. Steve Moore and Randy Ubry-Terrell, along with their sponsors were congratulated by other club members. Steve is a full-time farmer in the New Vienna area, and a graduate of The Ohio State University. Randy is a native of California and is employed by the East Clinton School District as a cook for the high school and middle school. 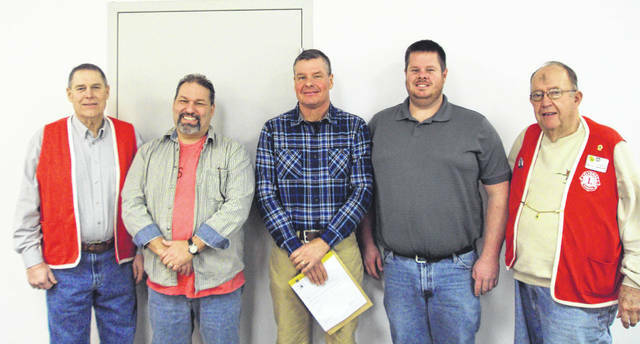 Shown, sponsor Tom Terrell (left) stands beside new member Randy Ubry-Terrell, along with incoming member Steve Moore, Club President Brad Hughes, and Lions Zone Chairman Jim Georges.